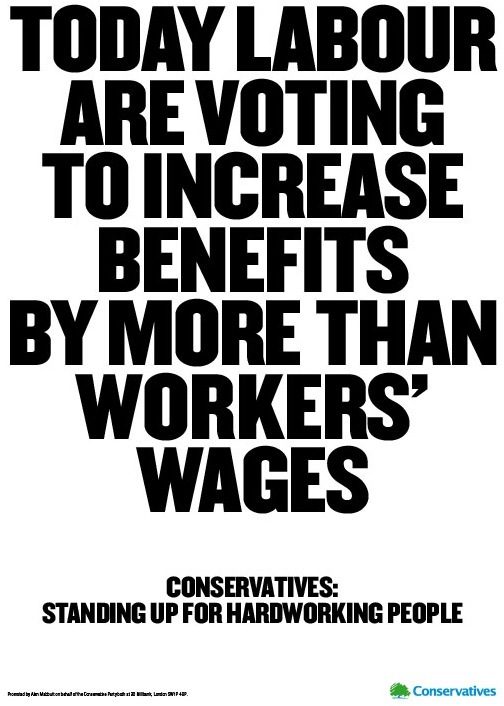 The Conservative Party have launched a new poster campaign on 6 sites across London to coincide with the House of Commons vote on benefits uprating that takes place today. The poster starkly points out Labour’s contradictory stance of calling for a freeze on public sector wages, but not on benefit payments. It’s not the most creative poster in the world, but it’s single-minded and makes a point that is likely to be salient with the majority of the population. Today seems like a significant victory for The Conservative Party and they’ve cleverly released a poster just to make sure everyone knows about it.